The Sena SMH10R Earbud Adapter Cable allows the user to use their own earbud speakers. 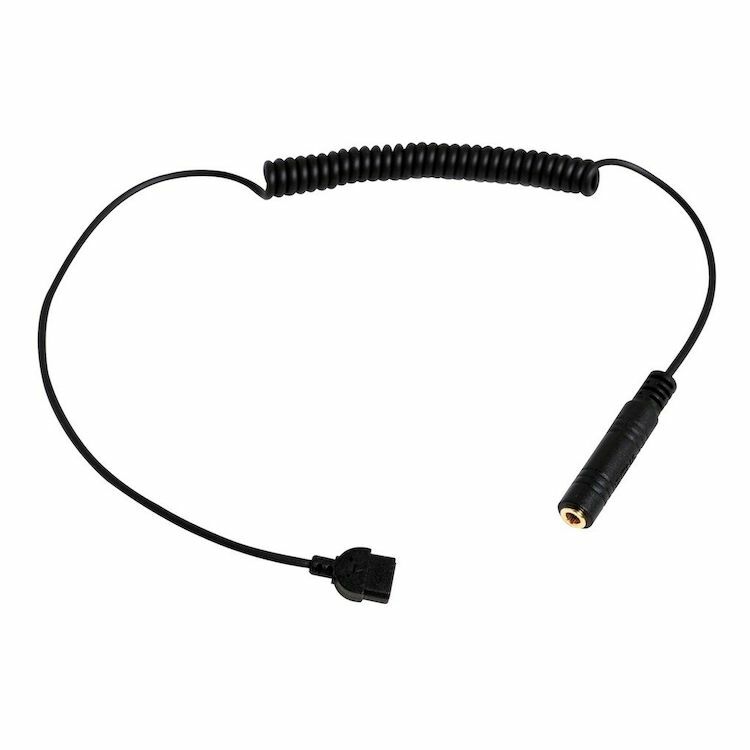 One end plugs into the speaker cable while the other end is a 3.5 mm plug, so that the user can connect his or her own earbud speakers. I enjoy the SMH 10R, but not a big fan of the sound quality, so I added the earbud adapter. Allows me the convenience of remote control, while having being able to enjoy music and navigation with minimal volume. My helmet has a lot of wind noise that interferes with the audio from the speakers. Using earbuds should help reduce the noise and improve the audio response. I purchased this so that I can use earbuds and use my Sena SMH 10R with my half helmet. This is an experiment, to see if ear bud work better at highway speeds. Have not tried foam ear plugs but intend to try both. The SENA microphones are very clear even with wind noise, vent open or closed. The Sena SMH10R Bluetooth is awesome on city streets, but on the freeway the wind doesn't let me hear my music very well. A revzilla rep recommended this item and it should make my riding experience a lot better thanks guys. My dual sport helmet was to loud with wind noise to run speakers, so I need away to wear earbuds. I wanted to be able to use my custom molded headphones wireless through my SENA SMH10. Lets you use earbuds with the SMH10R. Works really well. So I can use my earphones instead of plugs. The regular speakers distort easily and don't keep out road noise. Earphones that go deep and double as plugs are the way to go for long rides. I needed this adapter to hook up different speakers to my Sena SMH10R. Hoping to improve the sound quality by using my own ear buds in lieu of the supplied speakers. I want to get sound isolating earphones and plug them into my SMH10R intercom for longer highway trips. It can be hard to hear the speakers over the wind noise at higher speeds when I have ear plugs in. There are sound isolating earphones that are rated to block about the same amount of noise as a standard foam ear plug so I can still have hearing protection and not have to turn my intercom too high. Reviews for the SMH10R mentioned that the speakers, while loud enough, don't sound great. In case the speakers with the SMH10R are not the quality we like, we have an alternative method of listening. Wanted to use my own earphones to listen to music. because i wanted good sound quality for my music and the noise cancelling advantage of headphones. My ears are weird, I want to use my buds. My helmet pads may not hold the speakers in place as well as I would like so I opt for ear buds also. I have multiple helmets and bluetooth communication packages for different riding conditions. I've had nothing but excellent results with the Sena and Shoei products purchased through Revzilla. At times I prefer ear buds while riding. This product will add the ability to use earbuds if I should choose to. Because the OEM Sena SMH10R speakers provide sub-standard audio quality. speakers are ok in the helmet, but lack any low frequency and at higher speeds or windy areas, are hard to hear. So I can listen to music with my earbuds which doubles as earplugs. Will this work with the SMH10? Does this work with the 10U? Does the adopter fit the SMH-5 fm? BEST ANSWER: Per a review on a competitors site, no it does not. However, the sockets (the non-clip version) appear similar. Some simple splicing could fix than if you don't mind risking $5.95. Don't know if the mic would work. Sorry for the not so definitive answer. Is it possible to use this earbud adapter and have a microphone attached at the same time? BEST ANSWER: Yes - the adapter plugs in to the SMH10R in place of the ear speakers. The line to the microphone in unaffected. Don't really know. I run a full face helmet. Sorry. Hi, I have the Sena SMH10 dual pack and am looking for a way to use earbuds instead of the speakers - will the SMRH10R earbud adaptor work on my units - will the square end of the adapter wire plug into the charging port???? also looking for a wall charger unit for the SMH10. BEST ANSWER: The adapter is designed to plug into the same cable that the helmet speakers plug into, not the charging port. Super easy, just swap out the speakers for this cable, there is only one possible place to plug it in as each plug is a different shape. As for the wall charger, any USB charger will do - if you have one for your phone/table/iPod/etc. then you're good to go. The charging cable is a standard Micro USB plug too, so it is easily replaced. The earbuds plug right into a port on the helmet assembly that has the boom microphone with I believe a standard 3mm female receptacle into which the earbud jack fits. I charge the SMH 10 with a standard USB cable off a laptop. The same cable charges the smart phone. Alternatively the Android wall charge cable also charges the SMH10. I have an HTC Google phone. My wife uses custom earplugs with speakers. Get the Sena helmet base with a earbud port. It's about $25 - $26. Call Sena their customer support is great. For charging, any decent USB charger will work. I got a five port 40 watt charger at Amazon that works great. Charges both Sena units, two iPhones, and an iPad at the same time. Appreciate the answers - will order the SMH10 Clamp Kit - but worried about the reviews on the failures of the wires. Hi. I'm considering the SMH10R communicator. I'm a bit confused, though. Does it come with the battery pack or is that an optional item -- or is the battery pack that is sold separately designed to be a backup? BEST ANSWER: Hi. The package includes the battery. The adapter is used for speakers with the 3.5mm jack. I use this with the Torx speakers which gives considerably more volume and a fuller bass. Torx also has an amp but you will have to route wires inside your jacekt and put he amp in your internal jacekt pocket. The amp rocks! One of these days i will splice the Torx wires to the standard Sena connector since all these wires tightens the fit of my helmet. The new Shoei RF1200 has speaker wells built in so next year i'm changing out. You've asked the question not on the actual units page, but the earbud adapter page. Regardless, the smh10r comes standard with a battery. I do not have any additional battery, so I would assume the battery sold separately is meant for either a replacement or backup. If used as a backup the mounting may be a little difficult. If I recall correctly, unlike the unit itself, the battery is stuck on to the helmet via adhesive instead of a velcro. That said it could be difficult to swap them around. It is designed to be placed on the out side back of the helmet. By having the battery seperate from the rest if the unit allows for the thin profile on the side of the helmet. It comes with a battery pack. The one you buy is an extra. One battery will last about 8 hours or riding with music and stuff. Pretty good. BEST ANSWER: Can I use use my earbuds plugged into my iPhone connected to a Sena or do I need to get the earbud adapter cable to connect to my SMH10R? i have the Sena S20 will this work with that unit? BEST ANSWER: I really can't say. I have a Sena SMH10Rand it works great. From looking at the S20 photos I would say not. Will this work with the S20 units? BEST ANSWER: I believe the S20 has a built in ear phone jack and does not require this part.